Forget the unkept cool look that used to be the hallmark of bachelor pads. Today’s modern dude is as concerned about his home’s appearance, as he is about his own. Real estate designers and appliance makers are latching on to this growing market, coming up with quirky, custom-made designs that give the modern-day bachelor pad a persona of its own. Think Functionality: What’s the main purpose of your bachelor pad? Is it to wind down after a heavy day at work, or are you a party person who enjoys inviting your friends over to hang out? It’s important to know what your home will be most used for, and by whom. The elements and feel will change significantly, according to this basic objective for your home. Think Simple: Simple and sophisticated is the way to go. You want to maximise the utility of your possessions, at the same time maintaining a decent look. The more you pack into a small space, the more cluttered it will look. And the more cluttered your mind may become trying to maintain all of it! Minimalism might be the way to go, if you do not have the time to maintain all your things. It is also a great way to save money for the other things that matter (like a Smart TV, or a roadtrip with your gang). Match Your Senses: Are you the ardent football fan with the latest set of tees hanging around for want of use? Or are you the nerdy bookworm with a Game of Thrones novels fetish? A great way to “connect” with your pad is to customise it to your interests—a memento from your trip last year, or a specially curated collection of the photographer in you displayed on a wall. These minor add-ons are what will want you to come back home and seek some peace after a long day at work. Do Away With The Clichés: Sure, some clichés may be hard to ignore, like the evergreen recliner sofa of “Friends” fame. That does not mean every single typical bachelor thing must be seen in your apartment. Sticking to clichés leaves you with no originality, your place will end up being indistinct from any other. Does not serve the point of standing out for yourself! Rev up The Colours: A simple painting makeover, and your place may look as good as new. Men tend to stick to the dull greys and browns when it comes to coloured walls. Why not dare to try something fresh, like fire-engine red for a highlight wall. Not a bad way to shout out your unusual love for red. What’s more, it reflects the real you, rather than hiding behind the drabs. Dress The Windows: Men tend to leave the windows bare and basic, thinking curtains and frills are for the girls. We do not recommend getting the pink curtain from your sister, but there are a host of options to dress up your curtains in a masculine way. Opt for geometric patterns and solid colours, or go for sheen metallic blinds. Moreover, curtains or blinds insulate spaces, reduce noise pollution and prevent fading of furniture. Deck Your Furniture: Your furniture need not be limited to the odd mattress lying around and that dusty bean bag unused since ages. Opt for comfortable sofas in solid colours, with low maintenance linen. Men often fumble between choosing furniture styles—traditional or modern? Modern may seem too sparse and cold, though it’s generally considered more “manly”. But today you can choose from a wide range of eclectic and transitional stuff that’s somewhere midway between the above two. One can rent out one’s own type of furniture from the wide choice at Furlenco. Cases And Cupboards: Think bachelor pad and images of digital stuff strewn around like homeless beings, pop up in your head. You need to move away from that stereotype “messy man” look and de-stereotype yourself by getting better-organised. Get cupboards for your books and cases for your appliances. Not only will your place look clean and neat, your digital ware will be better protected from dust. For those who are more worried about their expensive work suits, you can go online and take it on rent. Functional And Smart Lamps: Do you struggle with the angle of light as you read your favourite books? Or are the glaring fluorescent lights an eye-sore during a drinking and movie-night with friends? Time to look at functional lighting— reading lamps, focus lamps, internal lamps for cupboards all these makes your life easier by doing just what they are meant for. Go a step further and opt for smart lamps which turn on when you walk in to the room and adjust light levels depending on ambient light. They are a great money-saver by being energy efficient too. Smart Thermostat: This is for those who are very particular about their room temperature for ultimate comfort. The Ecobee 4 is a great device, with a responsive display, a remote sensor and tons of smart integrations, including a built-in Amazon Alexa speaker. Though highly priced at around $250, it is a great long-term investment. Surround And Smart Sound System: A great sound system is a huge plus if you like to have people over for movie marathons or partying. Or even to listen to some soulful music all by yourself. Pick from some of the smart sound systems. Pair it with one of the well sized LED TVs for an in-house motion picture experience. Some suggestions are the Sonos Play 1, a highly compact and affordable smart speaker with super-reliable wireless streaming. Or the Bose Soundtouch 10, with great volumes and Bluetooth and shortcut buttons. Smart Kitchen Appliances: Whether it is a smart tea maker to brew your perfect cuppa, or a smart fridge camera that helps you take stock of your grocery levels, having smart kitchen appliances makes life so much easy. The Sage Smart Kettle BKE820UK and the Smarter Smart Fridgecam are great affordable ones. You may find yourself eating at home more, and even cooking for your friends and family, once a while! Gaming Zone: This is one for the gamers and their friends. If you have a large space, dedicate a room to your beloved PlayStation. Deck it up with gaming collectibles and mementos. Or else, a pad with small spaces can make do with a gaming corner. You can make this a multi-purpose zone by having other entertainment sources like a billiards table or dart board. August Smart Lock: With all these valuables in your home, its high time you secure it, smartly. August has come up with its smart lock that allows you to create digital keys for your friends and family by using their smartphones. It works on Bluetooth low energy, and even allows you to decide what are the hours or days in which other people have access to your apartment. Security definitely can’t get smarter than this! 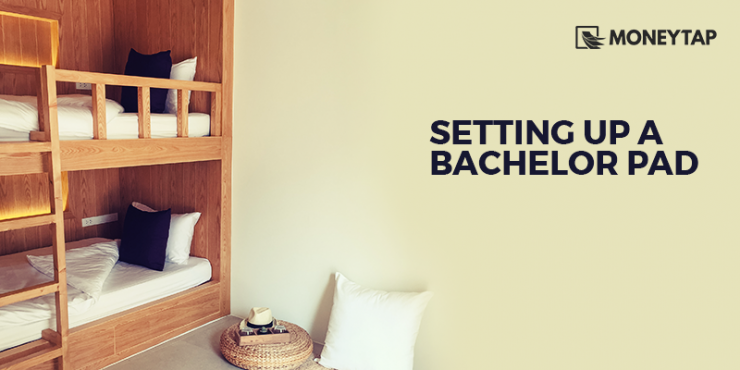 How to Finance Your Bachelor Pad? You may wonder how you could possibly buy all of these without going broke. But buying is not the only way to be a proud owner of the latest stuff. There are renting companies online that rent out objects of daily use, including living essentials as well as appliances. From furniture to upholstery to the appliance combos like TV, fridge and washing machine, you have them all at a fraction of a price compared to a purchase. You can even turn to financing options from online lenders like MoneyTap, to realise your dream pad. Renting such awesome stuff may just be the solution to liberate you from the financial considerations of living in your dream pad.